Hello, I have just installed Antergos 19.1 KDE with the minimal iso thing but somehow i discovered that some packages were not installed, like antergos-kde-meta. Can I get a list of what should a fresh kde installation include ? The Antergos meta package is for when you install a DE on your existing install, it brings the DE with some Antergos settings. (If you want two DE’S alongside or you decide to switch DE.) When you’re doing a fresh install Cnchi installs the system with those Antergos settings, so that’s why it isn’t installed on your system. About systemd, there were some bugs in the system that could be used by hackers. Redhat is fixing those bugs, so it is problably related by that. Could you tell us which packages were removed? 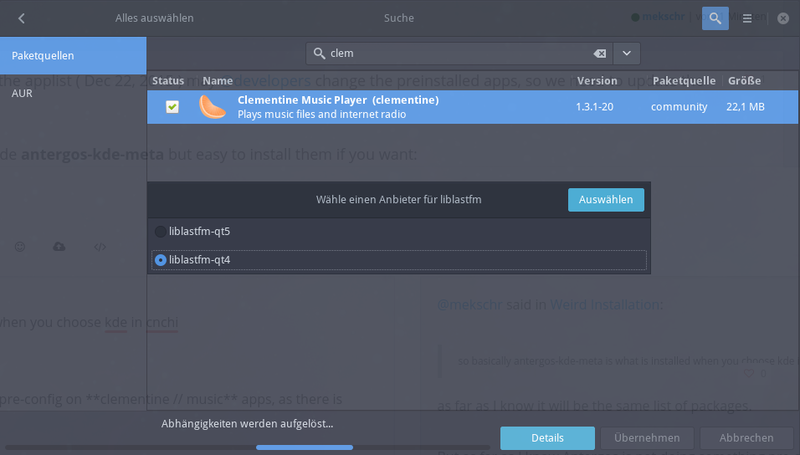 so basically antergos-kde-meta is what is installed when you choose kde in cnchi ? as far as I know it will be the same list of packages. That those two aren’t in the complete package may not be a bug, KDE neon doesn’t ship them also as default. Clementine has been replaced by Amarok and pidgin by Kopete.